Here’s a new little ditty for today. You like? It’s time for some weekly StuART! Here’s a new one. Just for you. And, hey, thanks for all the travel tips you gave me yesterday. Y’all have some nice travel tales to tell. Sweet! We’ve found some information about a couple of airlines – and, thanks to my pal who likes to pull my beard from afar – and some places to stay where pooches rule. Why not? Pooches rule. Yes. That’s my phrase for today. 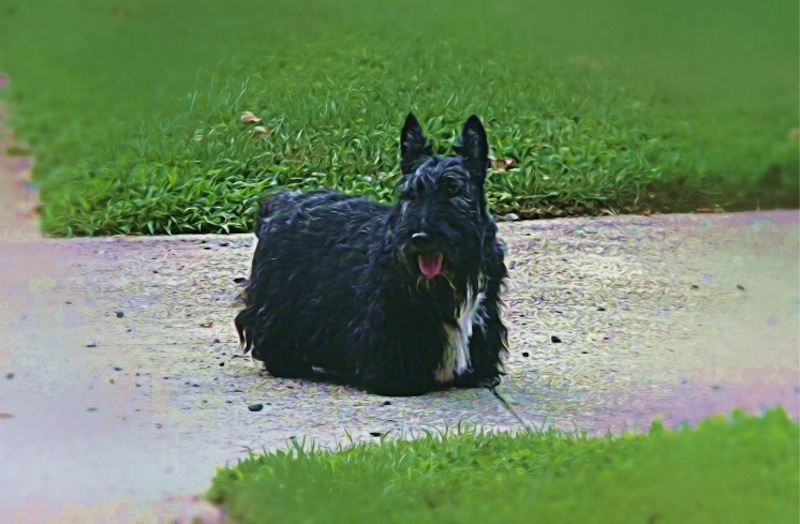 This entry was posted in art, dog art, Dog Blogs, dog photography, dogs with blogs, The Scottie Chronicles. Bookmark the permalink. Yes! And once again, I see no waddle. You. Are. The. Best. Girlfriend. Nice! Love the tongue hangin’ out, must be a hot one, yes? Do you ever take a bad picture? We love your handsome smile, Stuart! Looks like another hot day – and I’ll bet your panting, too. Do you ever run under the sprinkler on days like today? That would help cool you off, Stuart! You know what? I hate water. Only this year did I ever try walking under the sprinkler because I’m too lazy to go around. Go figure.